As if there wasn’t a wealth of content already available for players still enjoying the delights of Grand Theft Auto Online‘s globally connected world, Rockstar has today added some new tools and a dangerously unsafe vehicle for players to utilize however they so wish. The Hijak Ruston, which is available to purchase via the Legendary Motorsport store, is, as Rockstar dubs it, a vehicle that enables “you to get as close to the tarmac as you’re ever going to want to be,” but you can probably expect to pay the better part of your digital life savings in order to take it back to your personal garage for keeps. 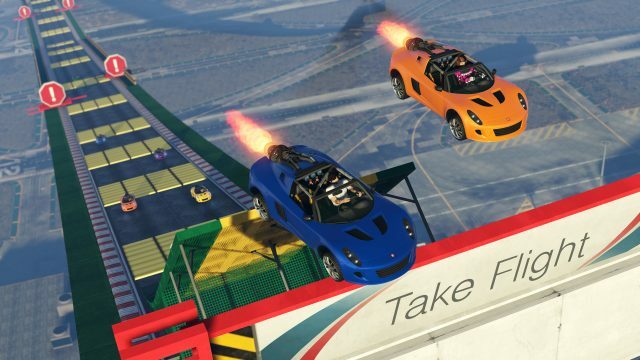 Along with the new ride, a selection of new tools for GTA Online‘s Stunt Race feature, including hurdles, boost refills and explosive crates have been added, all of which have been designed with the Blazer Aqua, Ruiner 2000 and Rocket Voltic vehicles in mind. If those names sound familiar, it’s probably because they’re the exact same gas guzzlers that took front and center in Cunning Stunts. If that’s not enough to satiate your lust for speed, psychedelic stunt tubes which take racers through alternate dimensions (probably not literally), and destructible walls should help to provide for all your adrenaline-fuelled needs. Grand Theft Auto Online is available to all owners of Grand Theft Auto V on Xbox One, PlayStation 4, PC and last-gen consoles and continues to drive sales of the title three years after its original release. We fully expect Red Dead Redemption 2‘s online counterpart to be equally as successful when it launches later this year.